Requests: OPEN! They've been closed a long time...but I'm opening them for a short time. Commissions: Always open. Ok, not always. But they are open right now. Name: You can call me Candice, but I'm also known as Lump/Lumpy and Violeta on other sites as well. Where I Live: San Jose, California. But I have lived all over. Seattle, Washington. Chicago, Illinois. Buffalo, New York. Dallas, Texas. Los Angeles, California. Brazil (yeah, the South American one.) Nashville, Tennessee. Yeah... I wrote this a while ago and didn't get around to typing it up till now. Beware, it is very random. Uhm, it's not very realistic, so don't get caught too confused by details. You are so sweet! Thank you for your comment and your fave. I draw all sorts of things, but I only post fan art here. That's why there are so many princesses. :) I do love my Disney girls, lol! OH! 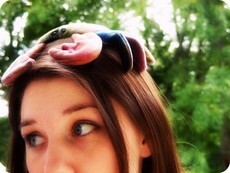 And my brother put a Beanie Baby crab on my head... :p That's my "hat"
Hurray! I'm so glad there is someone my age on Fanart. I feel like every profile I see says they are 14. :/ Haha. Happy Birthday, though! Of course! I'm having fun! Good gracious, I envy your skills. Your pics are awesome, really.